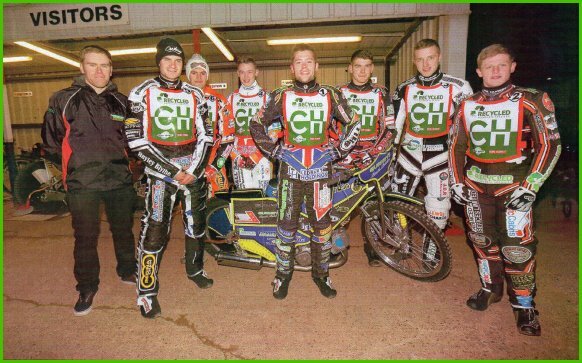 It's Cradley Heathens at Monmore! After winning the National League title the previous year there was always the question, could they possibly do it again? With the format of the league putting more pressures on promotion with a 40 point limit and riders not only missing matches through the 'doubling up', rule where riders could ride for Premier League clubs as well as National League, the BSPA decided to introduce a fast track draft system where selected riders from National League teams would be used as reserves in the Elite League. This of course meant that inevitably riders would be missing some matches. Also being League Champions the Heathens were riding with a target on their back, with everyone wanting to lower the colours of the champs. The management did a great job, almost too good in fact, with Steve Worrall coming in on a 'bargain', average and Tom Perry returning after a year out they were joined by newcomers Matt Williamson and Danny Phillips, Paul Starke was made captain and Max Clegg and Nathan Greaves moved into the team proper. 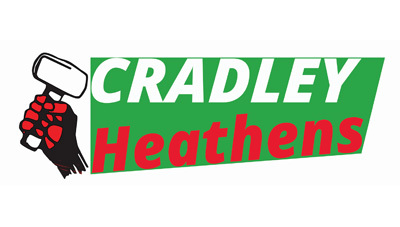 During the winter months it was decided that the team would revert back to the original Cradley Heathens name, a popular decision with most fans. Well, could they do it again? Of course they could, in fact they went all through the season with just one defeat, that came on April 21st, losing by just 3 points at Coventry. The team were so good that some fans were complaining that home matches were too one-sided, with the Heathens winning by more than 60 points most weeks and even scoring more than 70 points on a couple of occasions! Paul Starke capt. 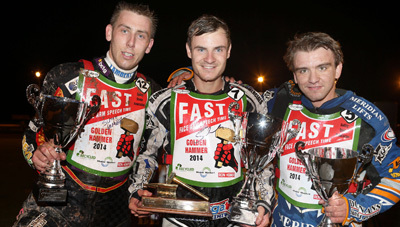 Danny Phillips, Tom Perry, Nathan Greaves. The Heathens were even able to cover for Steve Worrall when he got injured before the play-off finals, which was such a shame for Steve as he had such a great season in Cradley colours. Between them the lads put around 15 points on their average and Will Pottinger never had to use a tactical ride all season! 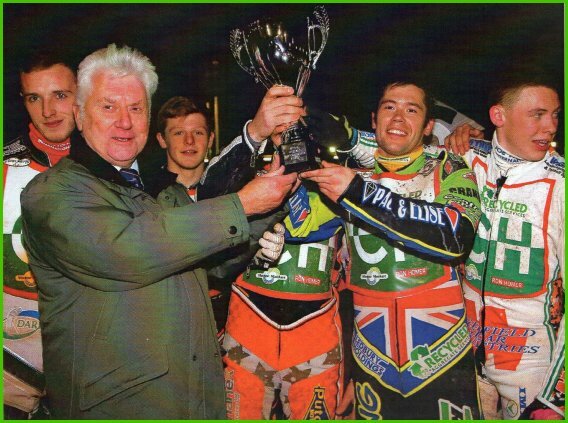 This was the icing on the cake really after winning the KO Cup against Kings Lynn's Young Stars and winning the Fours earlier in the season this was our most successful year since 1983. All the Heathens riders exceeded expectations with Max Clegg and Nathan Greaves really coming good towards the business end of the season. Matt Williamson and Danny Phillips turned out out to be excellent signings, Paul Starke had a great year as captain Tom Perry held is own in the engine part of the team and Steve Worrall ended up with an average of 11.34 from his 18 matches with the team and was runner up in the National League Riders Final with 13 points, what more can you say about our top rider? Crowds at Monmore Green were the best in the National League once again, unfortunately the news from Ladbrook's the owners of the stadium was not good. They dropped a bombshell in October that they wanted the stadium for their own use in 2015 and therefore would not be available. 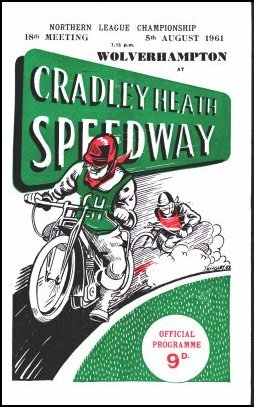 This was a shocking blow for the devoted Heathens fans to lose their track once again 20 years after losing Dudley Wood. The promoters worked hard behind the scenes and with the help of Tony Mole bringing back the Brummies into the National League the club was able to track share at Perry Barr for the 2015 season. Top four teams race off in two-legged semi-finals and final to decide championship. Nathan Greaves 9 (4), Paul Starke 8 + 3 (4), Danny Phillips 7+3 (4). This second leg was the result of the National League match counting for both compettitions. Cradley win the KO Cup 86 - 65 on aggregate. 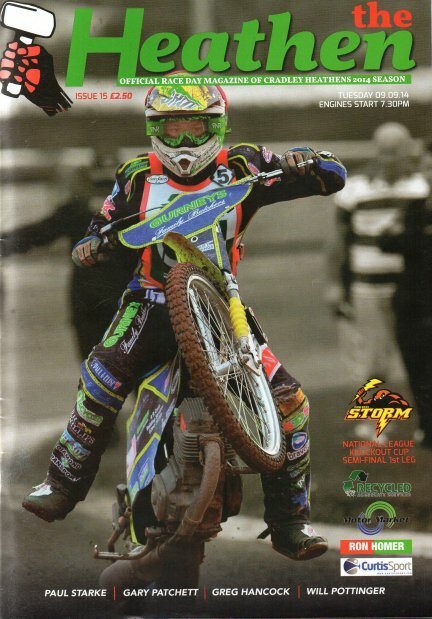 Semi-Final 1 - Coventry 18, Cradley 13 (Paul Starke 5, Nathan Greaves 4, Max Clegg 3, Tom Perry 1), Kent 12, Buxton 5. Copyright: Steve Johnson & Cradley Heath Speedway Ltd. 2015.